A ram is a male sheep and also a device for battering, crushing, or forcing something. Related to this last sense, to ram means ‘to strike with force,’ ‘to stuff or cram,’ or, figuratively, ‘to force or push firmly.’ Unrelatedly, the acronym RAM, in computing, stands for random access memory, and it is the computer memory available to the user. The ram was grazing peacefully in the field. The soldiers brought a great ram to break open the castle gates. The car rammed into the wall. The student rammed her books into her bag. The government tried to ram the bill through. This laptop comes with 4GB of RAM. In Australian criminal slang a ram is a con man’s accomplice, who acts as a decoy. However, this sense is now dated and rare. 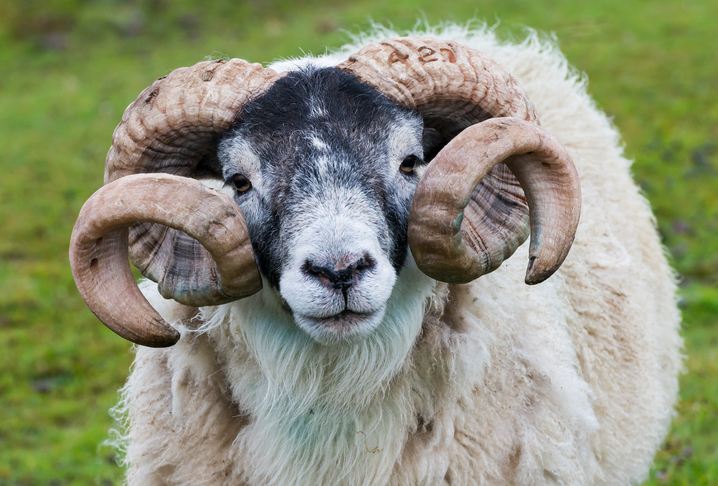 A ram, as mentioned above, is a male sheep, but, more specifically, it is an uncastrated adult male, especially one kept for breeding purposes. Rams are also sometimes known as tups, (mainly in Scotland and Northern England) and to tup, when we are talking about a ram, means ‘to copulate with a female sheep.’ In slang, to tup can also be used about a man copulating, although this usage is dated and vulgar. Another word for a male sheep is wether, but this is usually used for castrated males. A female sheep is called a ewe (pronounced like “you”). Ram dates back to before the year 900. The Old English ramm, rom or romm (depending on the dialect), meant ‘male sheep.’ By late Old English, the spelling had settled on ramm, and a second meaning, ‘a device for ramming’ (such as a battering ram), also became common. It is found as either ramm or ram in Middle English, as the second ‘m’ was slowly dropped. Its origin is unknown, but it is probably of West Germanic origin, because it is related to the Middle Low German, Middle Dutch, Dutch and Old High German ram (meaning ‘ram’). Many linguists believe that it is also probably related to the Old Norse rammr (strong) and the Old Church Slavonic ramenu (impetuous, violent). The verb comes from the noun, and dates back to around the year 1300. It originally meant ‘to beat with a heavy object,’ but that soon expanded to ‘to beat with force’ and ‘to stuff or cram.’ The figurative senses appeared in the 15th century. RAM, the acronym for random access memory, dates back to 1957.